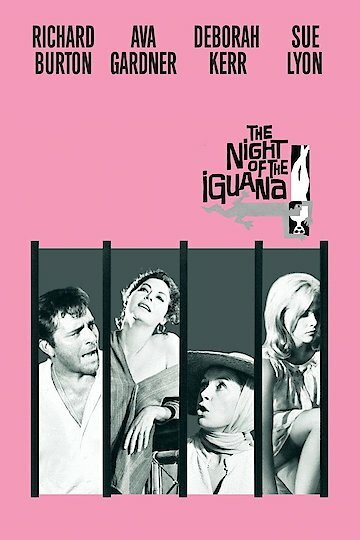 "One man... three women... one night"
The Night of the Iguana tells the sad tale of a minister who once was beloved and admired by the local community. However, his image, recently tarnished after it was discovered that this minister, Reverand Lawrence Shannon, has been having an affair with a very young Sunday school teacher. Fast forward a couple of years and now the young, Sunday school teacher has begun her own path in life. The clergyman has grown increasingly frustrated with his life, and in turn decides to take a bus full of holy women to the coast of Mexico while he is being faced with the task of conquering his demons. The Night of the Iguana is currently available to watch and stream, buy on demand at Vudu, Google Play, FandangoNow, iTunes, YouTube VOD online.